3 working lines with 3 cones set up 6 yds from one to the next. Players work through a routine of dynamic exercises to prepare the body for more intense exercise. 2 channels, 4 players on each. A plays double pass with B. B then presses A. A combines with C and moves around pressure from B (give-and-go). B then plays into D and activity is repeated from opposite end line. Play front foot or back foot pass? Benefits of each. Use pass as first step. Change pace when defender is drawn. Allow defender to curve run to cut off give-and-go option. Option 2: beat opponent with scissor. 2 channels. Approx 10x14yds. 3 teams of 2 players per area. 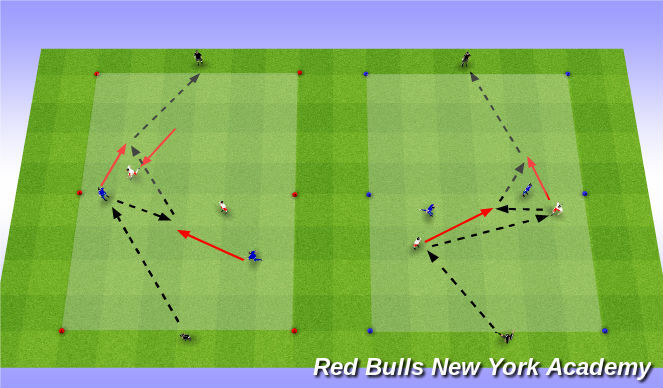 2v2 inside of area with 1 team of 2 acting as neutrals/targets who play on opposite ends. Team in possession play end to end possession. Play to 1 end and back = 1 point. Give and go = 1 point. First team to 4 points wins (or 2 minutes has passed). Winning team can chose to stay on or become neutrals. League system to create competitive environment. What if high pressure/man marked? Can targets play end to end? 4v4, one field. 2 teams play, one rest. Regular game rules apply. Pass in to replace throw. 1 goal wins game. Winner stays on. 1. Ball played into CM. 2. Ball played into CF.